Literally meaning Mandap pe Eshwar i.e. 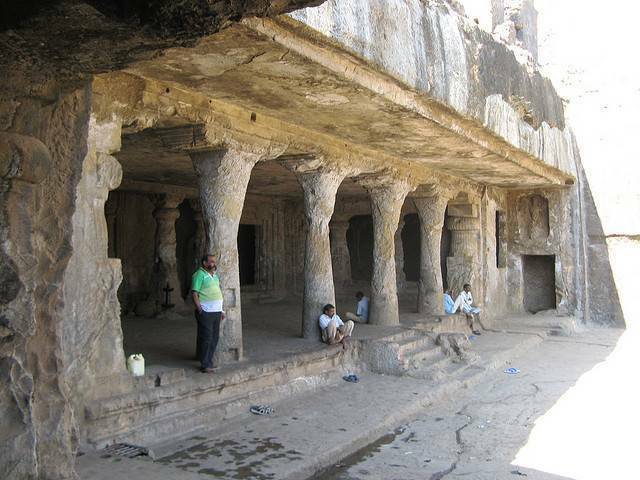 Hall of the painting of lord, Mandapeshwar Caves are believed to have been built in the 8th century. They consist of rock like shines, dedicated to lord Shiva. Located near Mount Poinsur in Borivali, they are small with remnants of an old Portuguese built church on top of the caves. Mandapeshwar caves have sculptures of Nataraja, Sadashiva and a splendid sculpture of Aradhanarishvara depicting the mythical tales of Hindu gods and goddesses. It also has statues of Brahma, Vishnu and Ganesh. There is a main cave in the courtyard and a smaller one on the left. The history of the cave is tumultuous and filled with stride, due to various attempts made to convert it into a chapel and Hindu temple.